Long time readers should remember how, in my review of Clouseaux’s (then) complete discography, I teased a horror-related side project of sorts at the end. Well, the wait is over and the cat’s out of the bag: I was referring to Grave Tone Productions. Founded in 2010, Grave Tone Productions is the creation of Brian Davis and Jay Brooks. Due to their unique style, the music of Grave Tone Productions is better suited for use in the “Haunted House of Rock” idea I brought up in last year’s review of Dead Rose Symphony than it would in most types of haunted attractions (although there are ways around this, I’ll have more on that later). In addition to Jay Brooks on Bass and Brian Davis on keyboards and drums (who also wrote all the music on their debut album), Music To Be Buried By also features guitar and bass work by Nick Whittington, Jason Davis David Cummings and Andy Salmon. “Sinister Foreshadowing” starts things off with an impressive soundscape of chirping insects, walking and howling wind. After a door creaks open and shuts, the sounds effects die down and our creepy narrator discusses the horrors to come. It’s perfect for use waiting room of your haunt before the next batch of guests is allowed in. A music box-like introduction starts off “6 Degrees of Suffering,” which is soon followed by touches of harp work and modern rock horror kicks in. The wordless female vocals during calm, eerie string solo are especially effective. “Room 324” starts off with a lot of feedback, clangs and screeching metal cries. This is soon followed by some whispering and creepy bursts of music. The sounds of a music box, electronic toys and the sounds of children make this good for a haunted nursery in a “Haunted House of Rock.” Said rock music comes in late into track, as well as a rather cool musical use of samples of a young child talking. “Nightmares and Lullabies” also features creepy children, along with eerie music. There’s an industrial feel and chimes that go back and forth between lighter and darker tones (along with plenty of samples). “Ghost Note Funeral Hymn” has an interesting Spanish funeral speech at the intro and outro. The rest of the track? Soft, slow piano work with creepy backing effects, like dueling choirs of both genders. “The Murder Game” also uses eerie, soft tones with loud bursts of samples. The excellent great piano work and guitars also provide a great creeping feel. “Walking Corpse” mixes samples from Night of the Living Dead with rockin’ guitars. You could use it in a “Haunted House of Rock”‘s zombie scene, but I really think this works best if you play it for people waiting in line. Soft marching drums and mournful piano start off “Deathmarch,” but a definite rock bursts in soon enough. Despite being named after a 1963 horror movie, “Violent Midnight” starts with an 80’s horror feel and later adopts a more modern feel. The use of the female choir is very effective, as is the spooky sample. Those wanting something for use in a regular haunted attraction will love “Raining Fear.” In addition to the sounds of thunder and rain, there’s a piano dirge and horror stings that get faster and more frantic as time goes on. “The Procedure” is perhaps the most interesting track on the album. It starts with the sounds of someone entering a room where a patient is kept. The sounds of a heart monitor, drilling and screams lead to rock music that layers in the sounds of the heart monitor and flatlining. The music itself reminds me of a Dethklok song at times. In “Creatures in the Closet,” a piano leads to a scratchy recording of a child saying their prayers. The creepy chimes go well with the piano work, which soon merges with rockin’ guitars. I suggest playing this as people enter your “Haunted House of Rock.” The lengthy “7 and Death Makes 8” mixes fast, soft piano work with both soft wordless vocals, chimes and the occasional touches of rock. In other words, it’s like if the most sample filled Clouseaux track made sweet monkey love to Dead Rose Symphony. In fact, the Clouseaux connection becomes even more apparent thanks to its lengthy surf outro! If it had to summarize the musical style of Music To Be Buried By, I would have to say that it’s a cross between Clouseaux’s Beyond Good and Evil with something you might hear in a modern horror movie. Although this style of music wouldn’t really work for “haunted mansion”-type attractions, I think playing their music to psych up the crowd waiting to enter a wide variety of haunted attractions is a great way to build excitement so that people will want rush in (which you can take advantage of by hitting ’em with a really good scare). Another benefit to using their music at your haunt is that it’s all royalty free! That’s right, if you purchase their music, you can use it in a haunted attraction (professional or home) without having to pay any licensing fees. And if you email Grave Tone Productions to let them know about it, they’ll publicize your haunt on their website for free! 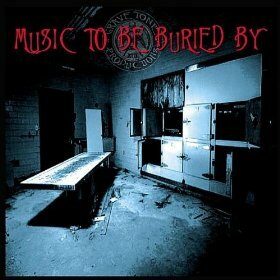 If if you don’t run a haunted attraction, the music is great to listen to by itself. You haven’t heard the last of them, either on 6’+ or in terms of future releases. In fact, they’re also getting into the horror film business! Here’s the trailer for their short film, Who’s There? (which also features their music).